Après une vague de chaleure, la sécheresse a été très importante. 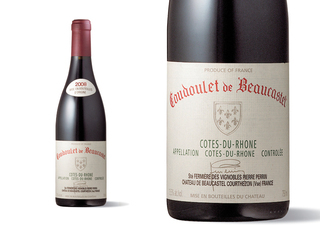 The 2003 Beaucastel Cotes du Rhone Coudoulet rouge shows notes of tar, scorched earth, herbs, black cherries, more rugged tannins, and a slightly drier, austere finish than the 2004. It is a good 2003, but for the Perrins, the 2004 is one of their great vintages. The deep ruby/purple-tinged 2003 Cotes du Rhone Coudoulet rouge (30% Mourvedre, 30% Grenache, 20% Cinsault, and 20% Syrah) offers sweet scents of licorice, pepper, black currants, and cherry jam. Spicy and medium-bodied, with a touch of dry tannin, it is not as huge a blockbuster as several previous vintages, but is a finely made red that should age nicely for 10-12 years.